Frangipane tarts are so versatile and can be adapted to use whatever fruits are in season. Stone fruits work particularly well, as do pears, apples and soft fruits like raspberries. You can also use other ground nuts in place of the ground almonds in the frangipane filling to complement the fruit that is used. A particular favourite of mine is ground hazelnuts with pears. I am keeping it simple here and using a classic almond frangipane topped with sliced plums. The thing that I love most about this tart is the fact that the pastry does not require blind-baking beforehand; the filling goes into the unbaked pie shell which makes life incredibly easy. I have also included my recipe for buttermilk ice-cream which is lovely and refreshing and something a little different. 1. Sieve the flour and icing sugar together into a large mixing bowl. Add the cubed butter and rub into the flour and icing sugar using your fingertips until the mixture resembles fine breadcrumbs. 2. Make a well in the centre and add the egg yolk and water. Mix using a fork until the mixture comes together to form a dough. Turn out onto a lightly floured work-surface and knead briefly. Form into a ball. Wrap in cling-film and refrigerate for at least 30 minutes in order to give the pastry a chance to relax. 1. Place, the butter and caster sugar into a mixing bowl and, using a hand-held electric mixer, beat together until light and fluffy. Add the ground almonds and mix until fully incorporated. 2. Mix in the eggs and then add the flour and Amaretto and mix these through also. Set aside until required. 1.Preheat the oven to 180C/Fan Oven 160C/Gas Mark 4. Roll the pastry out thinly on a clean lightly floured work surface and use to line a 20-23cm round fluted tin with removable base or an oblong tranche tin. 2. Spoon the frangipane into the pastry shell and smooth it out to the edges in an even layer with a spatula. 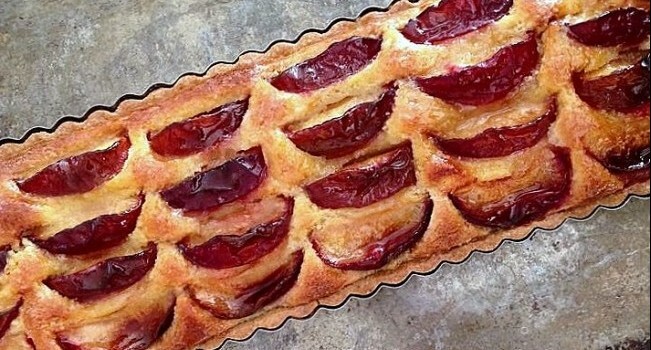 Arrange the sliced plums on top of the frangipane. 3. Bake in the pre-heated oven for 35-40 minutes until golden brown and the frangipane has risen slightly and feels spongy to the touch. 4. Remove from the oven and allow to cool to room temperature before serving. 1. Place the cream in a medium-sized saucepan and bring up to boiling point and then immediately remove from the heat. 2. Meanwhile whisk the egg yolks and sugar together in a medium sized bowl until well mixed together. Gradually pour the hot cream onto the egg yolk mixture, whisking continuously. 3. Return the mixture to the saucepan and place over a low-to-moderate heat. Stir constantly (about 10 minutes) until the mixture has thickened enough to coat the back of a spoon. Strain the mixture into a clean bowl and allow to cool to room temperature. 4. Add the buttermilk, creme fraiche and lemon juice and mix everything together. Refrigerate until cold and then churn in an ice-cream maker according to the instructions.